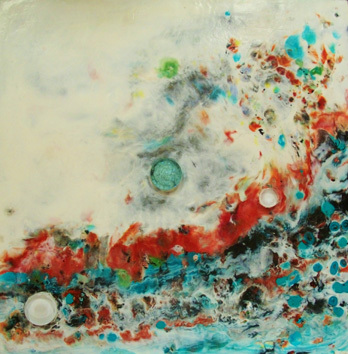 All about my journey in encaustic art and cold wax and mixed media. There's a time where we all find ourselves on the edge. Turning points where we must decide to take the road less traveled or stay the course. I seem to encounter them roughly every 5 to 8 years and feel the need to find a new adventure. It's what brought me to the mountains almost 7 years ago and it's what is pulling me back now. Having discovered my muse in the encaustic media, I came to western NC where my desire to be an artist would be nurtured...by the natural surroundings, the supportive community, and the time to immerse myself in it all. These have been productive years and I have been blessed to call myself an artist and find validation in both the sales of my art and the over a hundred students I have taught now. So why do I find myself on the edge now? Family and health...two very good reasons to relocate and it is only now that I feel confident in defining myself as an artist no matter where I plant myself. And that is a very good place to be...even if I am only on the edge right now. we are all on a journey whether we think of it that way or not. always moving away from or towards something. for me, it is back and forth between the physical and the mental, the family and the self, the past and the present, the here and the there. we are planning a move again, going back to Florida from the mountains where I came to start this art odyssey. i feel i have accomplished all my goals and then some, so it is time to move on and challenge myself to find my "place" now that i consider myself a "real" artist. when did that happen? i still remember the first call to say a piece of my art had sold - it was so exciting! looking back over the past 6 years i can't really say when i finally defined myself as an artist, because i know i always was, but i didn't feel i could tell people i was until i had "sold" my art. that seems to be common to many people I meet. their friends will say they are artists, but because they haven't sold anything, they dont identify themselves as artists. i now know this isn't the definition - you simply are an artist or not, and while selling definitely makes you feel empowered to tell others you are an artist, i think it is sad we often fail to see ourselves that way without it. so to all you artists out there, embrace who you are and state it proudly. art is a part of you and the act of creating it makes you an artist. selling it is just someone appreciating that fact. Incidentally, the piece below sold the first night of an exhibit to an opera singer that I noticed staring at it. I spoke to him about the fact that it was my favorite piece of the series and we both agreed. I so love to be there and meet the person who connects to the work and takes it home. i always liked e.e. cummings habit of not capitalizing, so i hope you will excuse me as i use this quirky habit myself. my love affair with wax shows no signs of the usual relationship woes...i am still enamored of this altogether wondrous medium with which to explore my creative energies. i spend hours daydreaming about colors and layers and letters and numbers and glass bits and fibers and writings and book excerpts and images and how they will all go together when i get back in the studio. so many options sometimes overwhelm me and i decide to just start with something...anything, and let the painting reveal itself to me. and yet, it is often the reworking of a set aside piece that makes for the best work in the end. so it was with both these pieces. 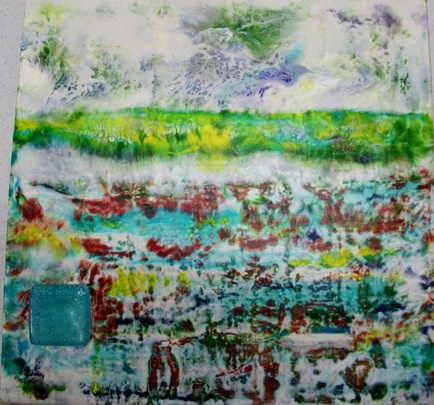 they were "finished" encaustic works, but i just never cared much for them, and decided to add obscuring layers and colors and see where they would take me. i now enjoy them even more knowing they have hidden depths and original meanings that have evolved into entirely different pieces.